Jônatas is a detail-oriented digital art director who uses UI, UX, visual and motion design to makes technology simple for everyone. The digital design profession has always been international, yet there are still difficulties in overlapping cultural spheres. The global market presents new challenges for designers to address language barriers and ethnic nuances. How might foreign users infer different meanings from presented data or metaphors? What accepted standards might be perceived differently in other markets, such as banner placement or selecting menu items? Most designers assume that designing products for foreign markets only requires a language translation, switching currencies, and potentially updating a few fields. However, cross-cultural design can be much more complex. I’m a fairly global designer, being from Brazil with most of my clients in the U.S. I thought I’d already be good at this. However, a Russian client approached me recently, and I quickly realized I had taken cross-cultural design for granted. Not only was I designing a product for a specific cultural condition that I didn’t quite understand, but I also found the cultural divide between the client and I to be a significant barrier to my workflow. Designing for global markets predates digital industry. Cross-cultural design research is rooted in the work of two individuals: Fons Trompenaars and Geert Hofstede. Trompenaars is widely known for “The Seven Dimensions of Culture,” a model he published in “Riding the Waves of Culture.” The model is the result of interviews with more than 46,000 managers in 40 countries. Rather than distinguishing cultures simply by language, Trompenaar established these seven differentiating qualities. Universalism versus particularism: Do people place value on rules, laws, and dogma? Or do they believe the world to be circumstantial? Individualism versus communitarianism: Do people believe in personal freedom and achievement? Or is the group greater than the individual? Specific versus Diffuse: Are work and personal lives kept separate or do they overlap? Neutral versus emotional: Do people make great efforts to express their emotions or are they kept in control? Achievement versus ascription: Are people valued for what they do or who they are? Internal Direction Versus Outer Direction: Some cultures profess to control nature and the environment, while others believe the opposite. Hofstede also contests conventionally narrow views of language and culture. Everyone knows that our spoken accents develop based on where we grew up. Less spoken about, though, is that how we feel and act is also a type of accent influenced by our locale. Because Hofstede’s research was entirely conducted by IBM, Hofstede’s research may be more easily translated into market applications. The cultural dimensions represent cultural tendencies that distinguish countries (rather than individuals) from each other. The country scores on the dimensions are relative, as we are all human and simultaneously we are all unique. In other words, culture can be only used meaningfully by comparison. How do users respond to authority? Hofstede placed every country somewhere on his power distance index (PDI), which measured how societies accept power inequality. Some cultures expect information to come from an authoritative position, whereas others believe less in expertise and certification. Thus, the implications of this for digital design are that expressive and authoritative language or imagery may perform well in high power distance locales. Yet, users in low power distance countries might negatively respond to this and prefer to see a relation to more popular imagery, or daily life. Do users see themselves as individuals or a part of a group? How might you motivate a user in an individualistic culture versus a collectivist one? Does your product promote individual or collective success? How do you reward users? Some societies place an importance on youth, whereas wisdom and experience is valued elsewhere. Hofstede measures this on the individualism vs. collectivism index (IDV). Countries with high numbers on the index are more individualistic. 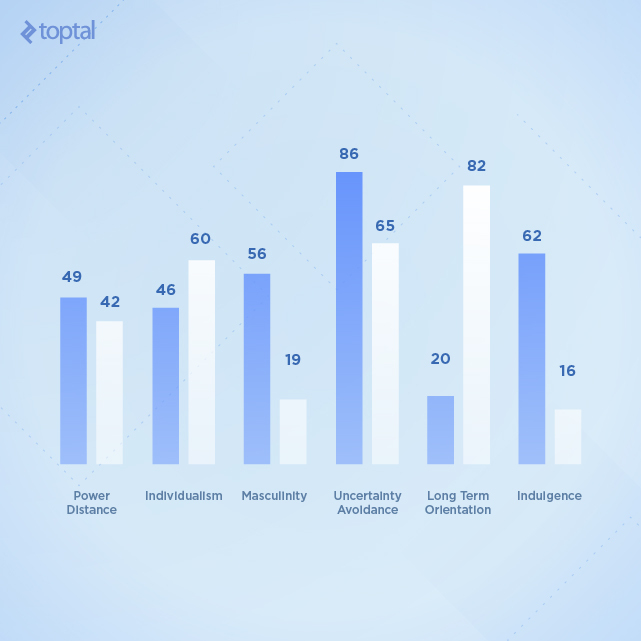 How comfortable are users with uncertainty? Cultures that rely less on rules and rationality respond to emotional indicators. But a society that is uncomfortable with uncertainty prefers clean and distinct choices. How might these different groups respond to rules and restrictions? For example, Germany scores high on the IDV index; therefore, it typically avoids uncertainty. This means that products designed for Germany must give users a rational sequence of decisions to make. Whereas, countries that are lower on the scale can allow users to find their way, or explore through an interface. When I was hired by the Russian client I mentioned earlier, the product they wished to create was relatively straightforward. They were in need of an app that could notify contacts when a user came into personal danger. If a user felt that they were being followed, or approached by a dangerous individual, they open the app, press the main button, and if after 10 seconds a pin was not entered, the contacts – or bodyguards – would be notified. 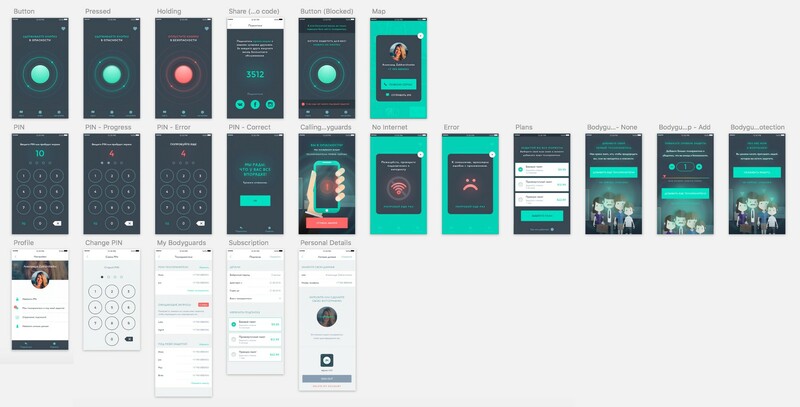 Fortunately, the client provided wireframes and user flows so my job was entirely focused on UI and visual design. 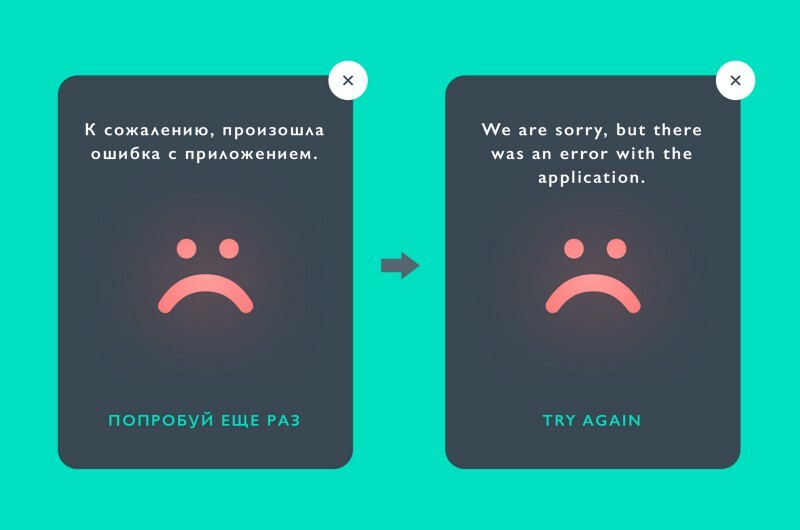 Immediately, I was stunned by the Russian alphabet the client provided in the user flow. I simply didn’t have a Cyrillic keyboard, and I thought I might have to copy and paste from Google Translate if the necessary text wasn’t already in the user flows. Solution: I took the time to produce a comprehensive document of all of the phrases the app needed and asked the client to review it, not only to translate it, but also to ensure that all of the nuances were appropriate. Interface designers will always argue over the Sketch vs. Adobe debate. But all preconceived notions go out the window, when you realize that certain languages provide program limitations. For instance, not all fonts work for different alphabets, and each application processes fonts somewhat differently. I learned, during the same project, that some fonts in Photoshop could translate to Russian text, whereas the same font in Sketch would revert to a system font, and disrupt the layout. Whether this is an OS or software issue, I am unsure. Solution: There will always be some trial and error when determining which font or program to use. I found myself sticking with Sketch and working to find a font that translated. My first choice though would have been to be able to use the font I initially chose for aesthetics. Sometimes we have to compromise. Legendary Graphic Designer Paul Rand taught us that the form of words creates graphic shapes just like any other element. We communicate with typography using the shape, distribution, weight, and spacing of characters. Thus when changing languages, your graphic intentions may change along with the language. This becomes quite the challenge when you are unfamiliar with an alphabet. Good typography plays a big part in the visual design and is one of the most important elements in an interface, and I particularly like to work on kerning, line breaks and give emphasis to certain words, among other things. But how do you do it on your own when you don’t understand the language? How should you adapt a sentence, or create expressions, without knowing even the basics of a particular language? Solution: This was the one step that still required some heavy back and forth between the client and I to ensure that everything was communicated correctly. We had to be sure of the nuanced metaphors to be communicated, not just grammatical rules. In hindsight, this wasn’t quite ideal, but for the scale of the project it worked. I couldn’t have afforded to hire my own copywriter, but if you have the budget, I highly recommend hiring one to increase efficiency. A well-understood principle of interface design is to consider user demographics, as it influences consumer decisions and actions. But, it can be difficult to understand the culture of a remote society. Demographics are especially important when designing the brand for a new product. Symbols and metaphors are highly dependent on users’ perceptions. This part of the process required several rounds of revisions. 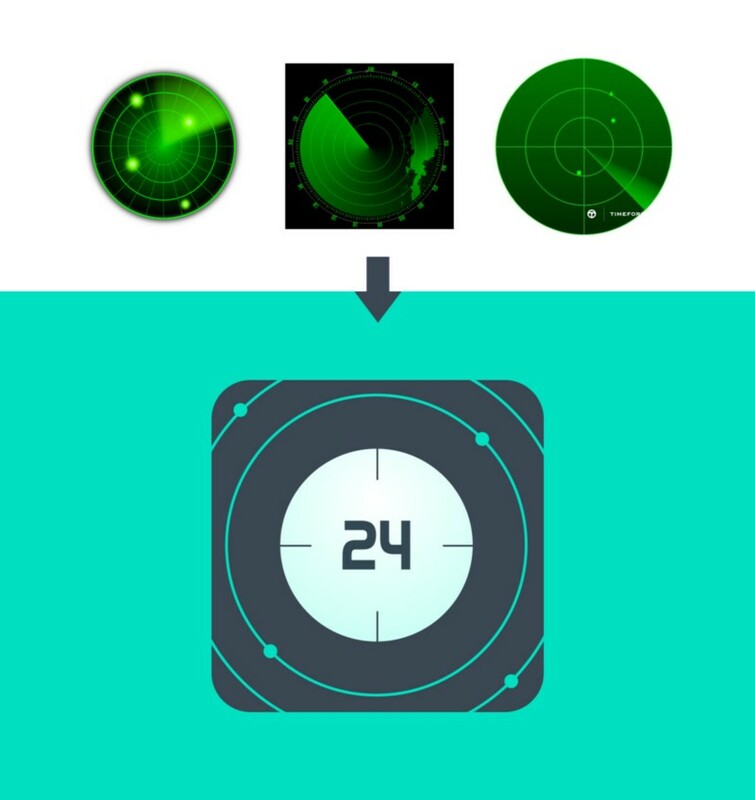 For example, my client and I had very different perceptions on the use of radar, whether it was for monitoring or locating. The theme changed to relate to family instead – a concept I’ve found is shared equally across cultures. Solution: if you’re not familiar with a particular culture, research and discover what might work. Many symbols hold multiple meanings across cultures. For example, the American OK hand sign is very insulting in Brazil. This project was especially challenging. It made me see beyond conventional notions of demographics, toward broader issues and specific tool changes. Now, I know that languages can create challenges for the use of symbols and themes, not just in speech and writing. I also no longer trust Google Translate for the particular nuances required in UI/UX design. User perceptions change between cultures as do languages. What have you learned in some of your first cross-cultural design experiences?